As we all know (mostly because our moms told us), 401ks are the best retirement income planning method around. However, like most things in the investment world they’re shrouded in mystery and uncertainty. What’s the safest amount to put away? How do they work? What should my 401k look like by this age? How much money will I need to retire? These are all questions that can seem daunting or worse: too far away to worry about, but it’s important to have a cohesive retirement plan from the day you enter the workforce. If you’re blooming later than most folks, that’s not a problem. It just means that you might consider investing in retirement income planning services that can guide you through your own financial goals and help you understand what will make you feel comfortable when the retirement party several years from now is starting to clean up. Yes, a 401k is, technically a bank account, but it’s so much more than that. The best place your 401k can be in is completely forgotten about. Set the percentage you’re putting away when you start your new job and don’t look at it for a while. Once you have a fair amount of money accumulating in it and you’re looking for employment somewhere else, you might notice things in their benefits package like “matches your deposit up to 15%.” The money that you put into your 401k is pre-tax, which means you’re getting free money from your employer in the form of a match in many cases. 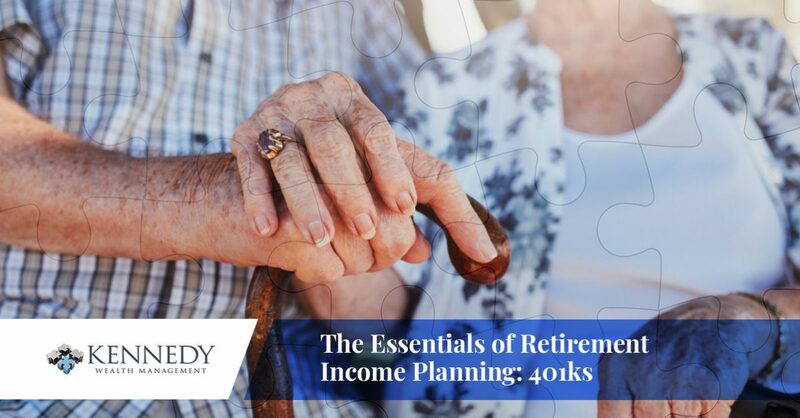 When you start considering retirement income planning, which we recommend you pursue this as early on as possible, you need to be able to look at your 401k, at the very least. Reach out to your HR person and figure out how to look at your 401k account. If you’re looking for your old 401k, reach out to your old employer and ask about when you were on their 401k plan. It should be relatively easy to hunt down and gain access to if you have your ID and SSN. Once you get inside your 401k, take a look around. Many 401k providers have a pretty detailed pie chart that you can check out and analyze your mounting, hidden wealth. The pie chart is representing your “asset mix” which will describe how much money you have in the account and what you’re contributing on the regular. Lately, employers have been encouraging folks to save for retirement and they are automatically enrolling their employees in the 401k plan. This is to aid people who assume that there will be pensions and Social Security available by the time they reach retirement age. You’ll probably sign something when you accept the position and they’ll list how much they’ll be putting into the account on a per paycheck basis into your account. Confused? Don’t worry, we’re here to help. Kennedy Wealth Management is here to assist you in all of your retirement planning investments and understanding how to ensure that once you stop working, you’re prepared to take care of yourself for the rest of your life. Reach out to us to ensure that your retirement is as fulfilling as you always dreamed it would be in Woodland Hills.